Key Partners Consulting has been in the market since 2007 and specializes in two areas: legal and HR consulting. OUR MISSION is to be a key partner for our customers providing a better value offer for solution of legal issues and personnel development tasks within the geography of our presence. The training of Key Partners Consulting LLP has provided us with a set of tools for the personnel appraisal. It provided us with excellent opportunities for efficient recruiting. Now there are right people on the right places. Separately we would like to note the attractive aura of the training and the professionalism of the trainers of Key Partners Consulting LLP. Key Partners Consulting LLP has helped our company to register a representative office in Kazakhstan, as well as affiliates in Astana and Shymkent cities. In addition Key Partners Consulting LLP is rendering us services on the personnel selection for top positions and frontline employees. 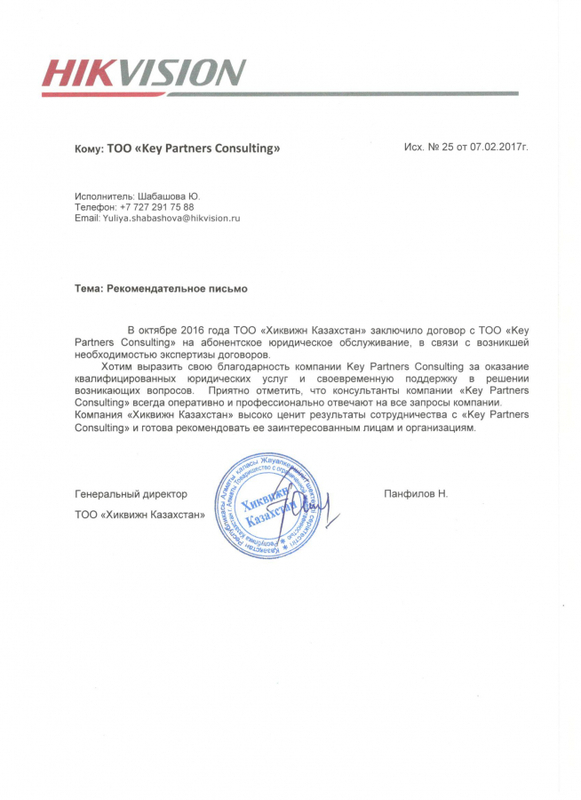 For three years Key Partners Consulting Company is our permanent partner. The company employees are characterized by efficiency and accuracy in performing the tasks assigned. 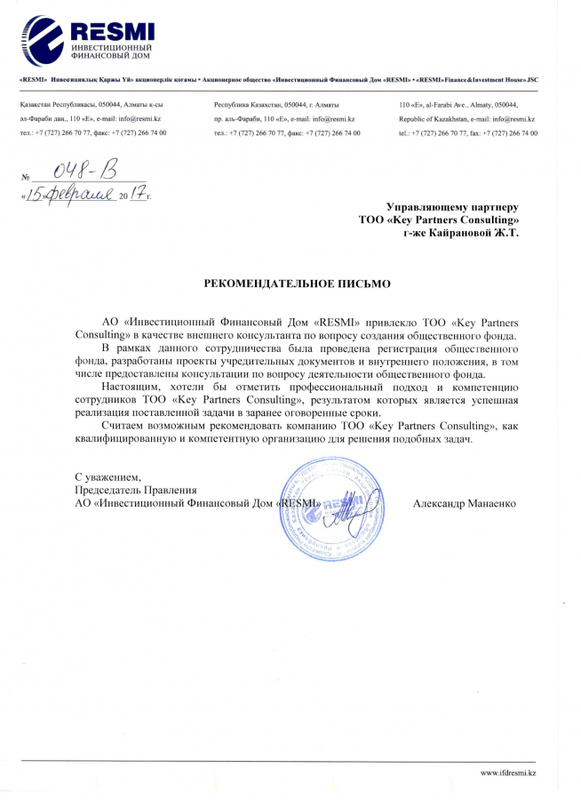 In October 2016 HIK Vision Kazakhstan LLP has concluded the agreement with Key Partners Consulting LLP for provision of subscription legal services in connection with arisen necessity of agreements assessment. We would like to express gratitude to Key Partners Consulting LLP for provision of competent legal services and timely support. MBK Expo group LLP cooperates with Key Partners Consulting LLP for over six years for provision of legal support to our company. The employees of Key Partners Consulting LLP perform their work qualitatively and with good faith, all tasks set are accomplished within agreed timeframes. The employees of our companies have passed the course of training for managerial skills development on the basis if DISC and HR Consulting technology. We received the tools for evaluation of the individual potential of employees and the tools for the personnel management in the coaching style. In January 2015 our company addressed Key Partners Consulting LLP with the task of performing a team audit by the Thomas System. During the training special attention was paid to team and individual exercises that have significantly increased the understanding of new information. Our cooperation with Key Partners Consulting LLP continues since 2016. During this period the company has proved to be effective. In the course of work the consultants of Key Partners Consulting LLP provided all necessary information in a constructive and timely manner, rendered competent services of the personnel selection, correctly observed all agreements reached during negotiations. Key Partners Consulting LLP has rendered Sino Technics Sauda LLP the services on the recovery of debts receivable which included the settlement agreement, legal representation in court, as well as the monitoring at the stage of enforcement proceedings. Besides attainment of the positive court decision, the employees of Key Partners Consulting LLP provided the return of the total debit indebtedness. "We are sure that the personnel appraisal according to the Thomas system will allow us creating a sophisticated personnel rotation system, qualitatively improve the personnel motivation policy without increasing financial expenses for material incentives by using only personality traits of the employees, their potential capabilities and aptitudes, degree of their satisfaction with performing this or other type of work". Asia Credit Bank JSC expresses its gratitude to Key Partners Consulting LLP for the competent and timely provision of services on the personnel selection and development. We hope that our further cooperation will be as fruitful and mutually beneficial. Dear team of Key Partners Consulting Company, please accept our sincere gratitude for the training conducted by you for the managers of Grindeks JSC. We received objective evaluations of the competence level of our employees, and most importantly clear and specific recommendations for their development. 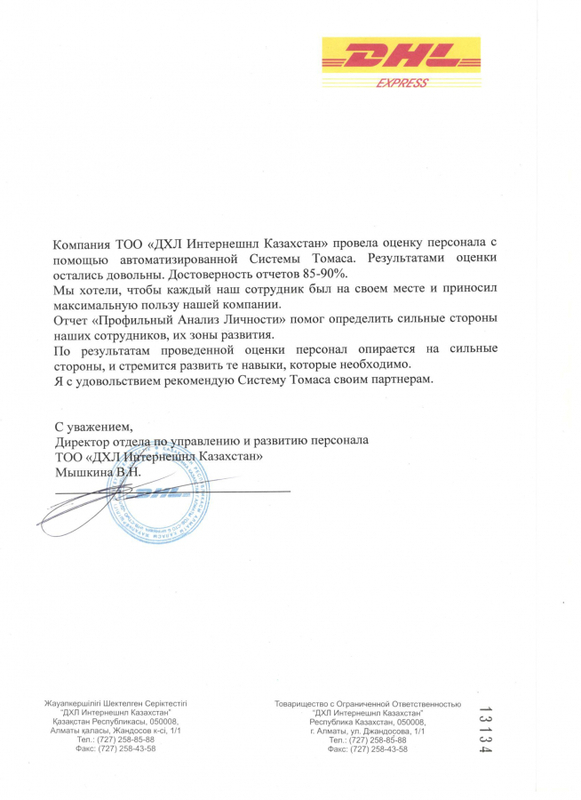 Dear Zhanar Tilekabylovna, the Department for provision of services to VIP clients of Kazkommertsbank JSC expresses gratitude to Key Partners Consulting LLP for the corporate training on the clients typology conducted on October 24 and 25, 2015. "Key Partners Consulting LLP is the business partner of KEN DALA CENTER JSC for provision of recruiting and consultation services. KEN DALA CENTER JSC recommends all interested persons Key Partners Consulting LLP as a stable enterprise and a reliable business partner for obtaining competent and highly professional services in consulting". Damu Entrepreneurship Development Fund JSC together with Key Partners Consulting company has performed the work on appraisal of the Fund's employees included in the personnel reserve. The appraisal performed has completely justified our expectations. Using the personnel appraisal by the Thomas System allows saving time and expenses for the personnel evaluation and receiving objective results due to the high system validity. 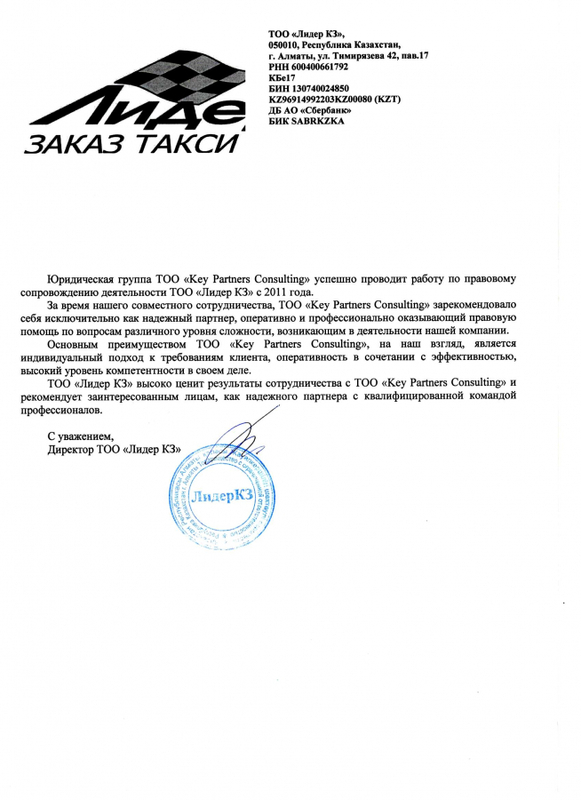 Upon the request of Damu Fund, Key Partners Consulting company has implemented the project on the human resources management having performed the team audit of collectives in all branches of the company by the Thomas System. The project has covered over 200 people and was carried out for four months. RESMI Investment & Finanical House JSC has involved Key Partners Consulting LLP as the external consultant for creation of a public fund. Within this cooperation a public fund has been incorporated, drafts of constituent documents and internal provisions have been developed, as well consultations on the public fund's activity have been provided. The Thomas System is applied in our company since 2015. It has proved to be effective in the personnel selection. The system helps to determine the behavior model of a person and create conditions for professional growth and development of the employees. In 2016 Bang and Bonsomer Ab LLP addressed Key Partners Consulting LLP due to the failure with recovery of debit indebtedness by own forces while having the court's decision available. 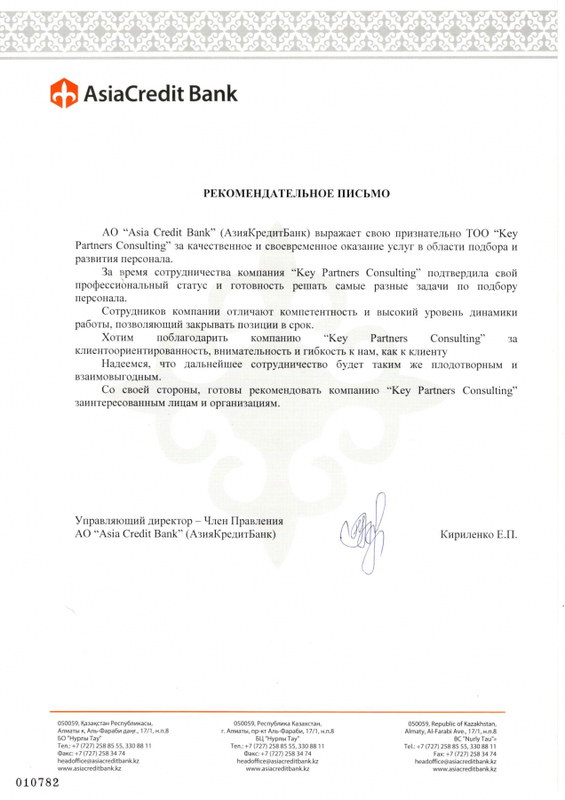 Owing to the professional efforts of the employees of Key Partners Consulting LLP the debitor's account was arrested and the total amount of accounts receivable was recovered in our favor. 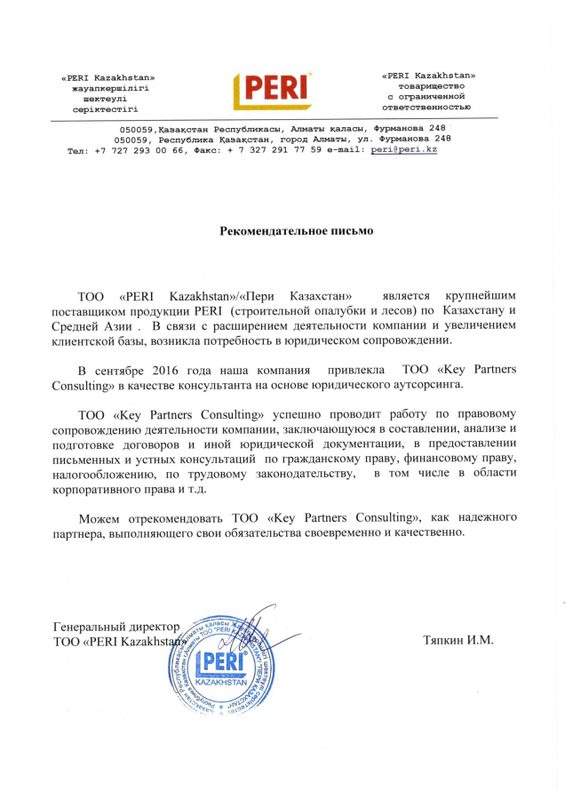 In September 2016 Peri Kazakhstan LLP has involved Key Partners Consulting LLP as the consultant on the basis of legal outsourcing. Key Partners Consulting LLP is successfully implementing the work on the full-scale legal support of the company's activity. 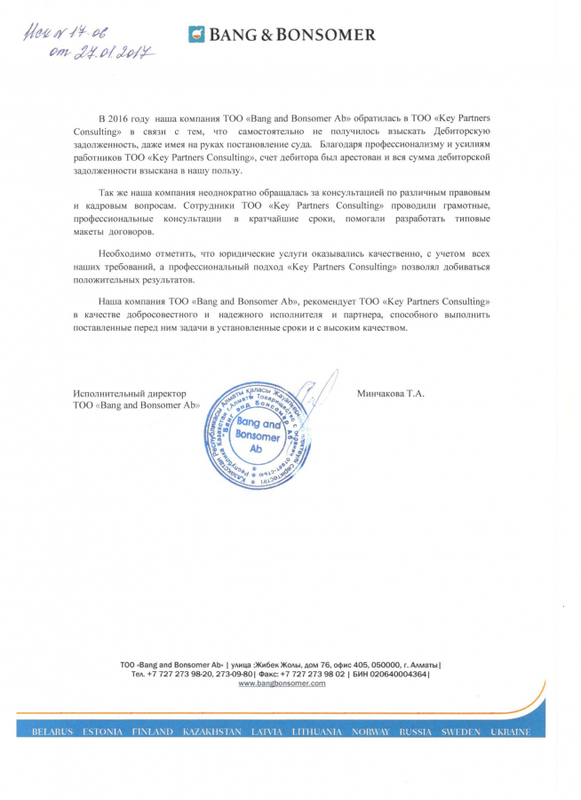 "In the course of the project implementation primary tasks for distribution of managerial powers have been determined, an accurate scheme of interaction of the head office with branches has been developed, main business processes have been developed and reserves of their optimization have been revealed, as well the plans on introduction of all business processes developed in the current activity of the Company have been discussed". 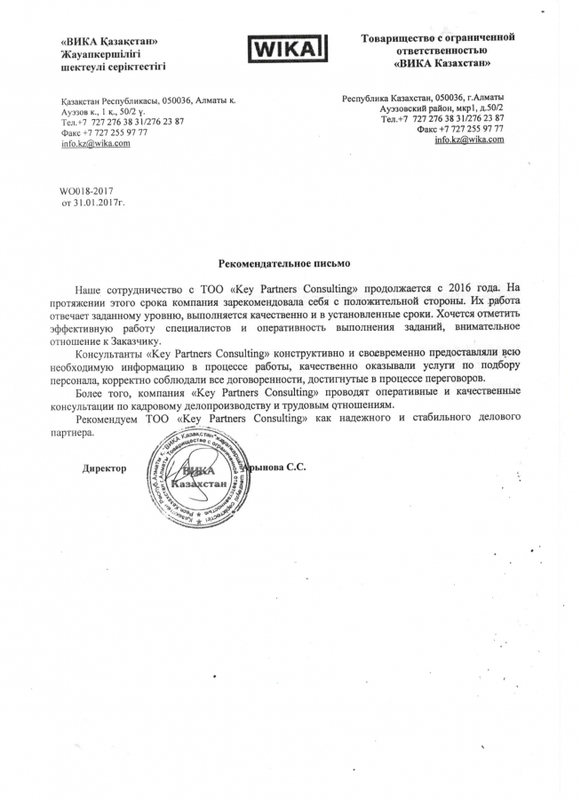 In October 2015 Almaty Electromechanical Plant LLP has applied to Key Partners Consulting LLP with the task of performing the personnel audit and rendering the services of legal support in recovery of debts receivable. The results of work performed have shown that Key Partners Consulting LLP is notable for accurate performance of contract conditions, observation of terms, quality and culture of works performance. "A large-scale work has been performed, the structure and normative documentation of ALSI LLP have been studied, on which basis the procedures for the personnel appraisal and certification have been developed. Models of competencies (corporate, managerial, position) with their detailed description have been developed. In the course of the joint dialogue with department heads KPIs for two company divisions have been developed". "The company successfully cooperates since September 2008 with Key Partners Consulting recruiting agency which has rendered us invaluable assistance in the search and selection of specialists in compliance with our requirements. Their work is attractive by the individual approach to the client's requirements, effectiveness combined with efficiency, as well as high competence level in implementing their activity". DHL International Kazakhstan LLP has performed the efficiency appraisal of the personnel by means of the automated Thomas system. We remained satisfied with the examination results. The reports validity is 85-90%. 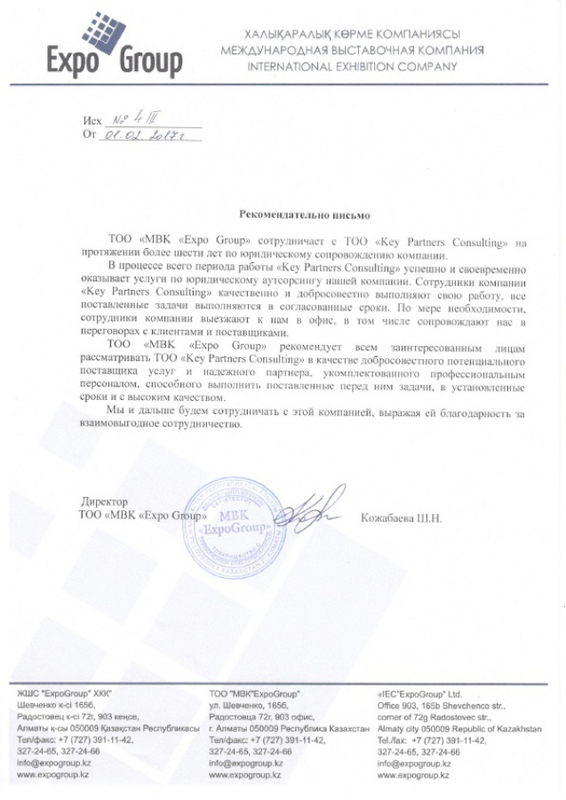 The legal team of Key Partners Consulting LLP has been successfully implementing the work on the legal support of the activity of Leader KZ LLP since 2011. During the period of our joint cooperation Key Partners Consulting LLP proved to be an exclusively reliable partner rendering legal assistance efficiently and professionally, on issues of various complexity level occurring in the activity of our company. 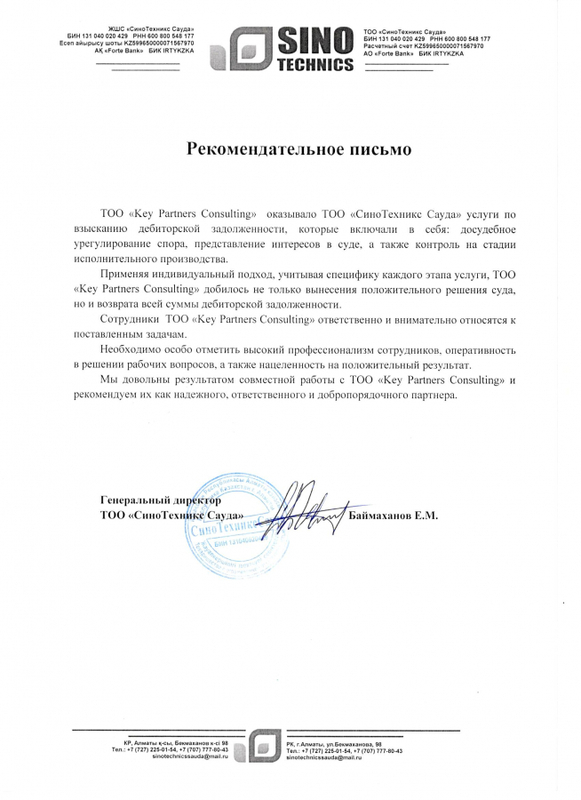 "By means of the Thomas System tools we have managed to improve the level of communications among employees, determine an employee's job competence, reveal the personnel's needs in training, improve the motivation system proceeding from real needs of the employees for development of the general working cohesive team of the company". We cooperate with Key Partners Consulting company in the format of legal outsourcing. We would like to note the efficiency of the company employees and high-quality consultations. 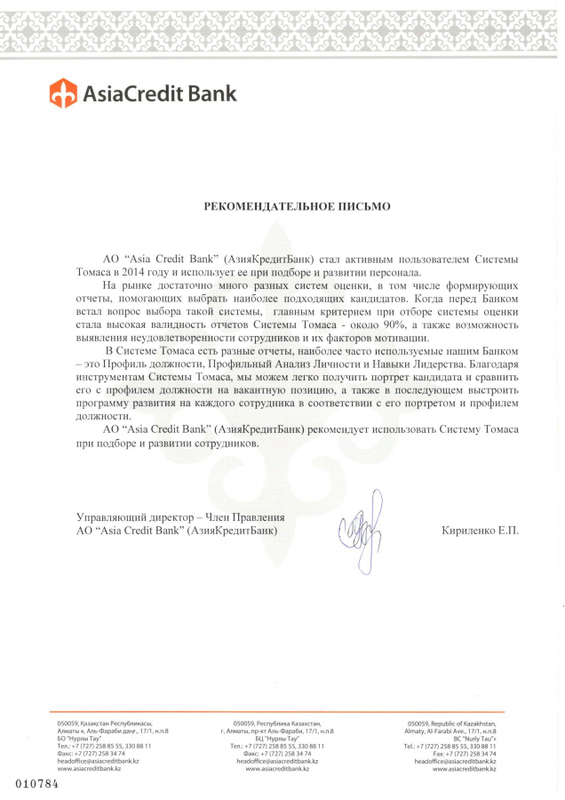 Besides we would like to thank for the assistance rendered in the recovery of debts receivable. We are ready to recommend Key Partners Consulting to our partners. "Metro Cash and Carry LLP uses the Thomas System in the personnel selection. The Profile Analysis of Personality helps to assess an applicant in more detail and provides a more extensive information on an applicant's profile concealed during an interview. The information in the reports is stated clearly and accurately. The Profile Analysis of Personality is an efficient tool which using may reveal potential variations of an applicant's behavior in these or other work situations". "In 2014 Key Partners Consulting company performed the assessment of key employees of the Supply Department of Kazakhmys Corporation LLP. The team audit technology allowing to model a profile of an ideal team; compare it to the profile of an existing team; determine its strengths and weaknesses; reveal excessively or insufficiently presented roles; balance them by selecting the most suitable directions, conditions and methods of the team potential development has appeared to be especially interesting and useful to us". "The team audit performed by the Thomas System allows assessing strengths and weaknesses of each team member and the team as a whole, explains which roles the team requires for the efficient and harmonious work, describes the roles of every employee in the team, determines the contribution of every specific member and in case of certain roles missing provides necessary recommendations as for the people that can compensate for the shortage ".